A refinery wanted to reduce costs during a recent project that proposed upgrading manual valves to automated ball valves. 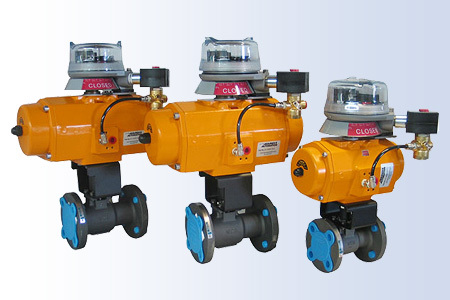 The specifications required an API 607 firesafe automated ball valve, spring return pneumatic actuator, explosion proof limit switch and explosion proof solenoid. Assured Automation proposed using the API 607 fire-safe approved 150F/300F Series Flanged Ball Valves assembled with a YH Limit Switch package. The YH limit switch offers extra terminals for terminating the solenoid inside the enclosure. The YH enclosure is FM approved explosion proof for C1, Div 1 & 2 areas. The YH Series has an easy access screw cover, touch set cams, light indicators, and visual OPEN/CLOSED indicator. The ease of access, ease of switch setting and visual light indicators save a tremendous amount of contractor time. The YH switch did not require explosion proof seal-offs for the solenoid or the limit switch which was a cost savings. The switchbox had passed FM pressure piling tests, so no seal-offs were required in Div1 or Div 2 areas. The refinery specified the Assured Automation products and achieved substantial cost savings. This entry was posted in Custom Projects and tagged 150F series Flanged Ball Valve, 150F/300F Series Ball Valves, 2-Way Ball Valves, 300F Series Flanged Ball valves, Actuated Ball Valves, Ball Valves, Custom Ball Valves, Flanged Ball Valves, Full Port Ball Valves, Limit Switches, Pneumatic Actuators, Solenoid Valves, Spring Return Pneumatic Actuators, Stainless Steel Ball Valves, Stainless Steel Valves. Bookmark the permalink.